Before 5/21/2019 a discount of $25.00 will apply to all Bear Female Registrants. Before 5/21/2019 a discount of $25.00 will apply to all Bear Male Registrants. 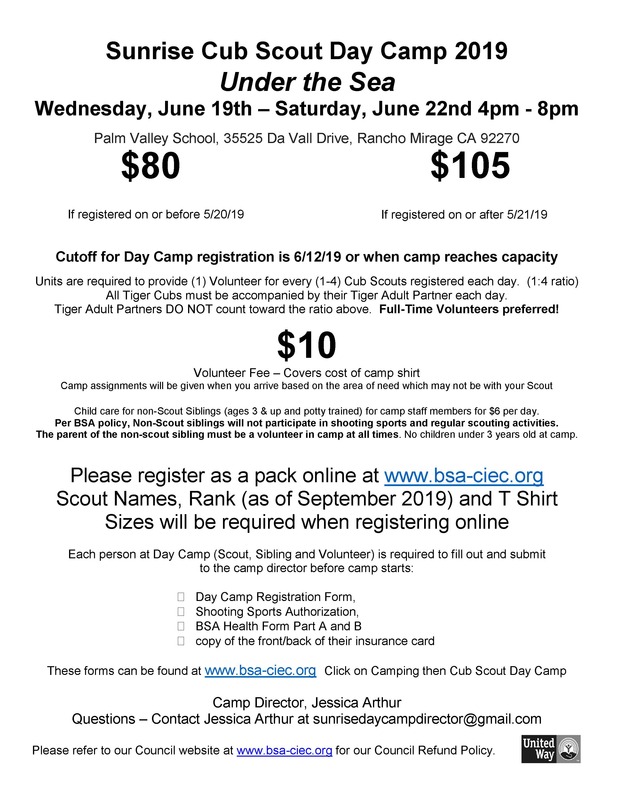 Before 5/21/2019 a discount of $25.00 will apply to all Tiger Female Registrants. Before 5/21/2019 a discount of $25.00 will apply to all Tiger Male Registrants. Before 5/21/2019 a discount of $25.00 will apply to all Webelos/AOL Female Registrants. Before 5/21/2019 a discount of $25.00 will apply to all Webelos/AOL Male Registrants. Before 5/21/2019 a discount of $25.00 will apply to all Wolf Female Registrants. Before 5/21/2019 a discount of $25.00 will apply to all Wolf Male Registrants.